Batu Kawan, Penang has been on the lips of property investors over the past few years ever since it was touted to be an emerging real estate hotspot in the northern region of Peninsular Malaysia. Made up of over 6,000 acres of mainly freehold land, the area is located off Seberang Perai on Penang mainland. It used to be an oil palm plantation belonging to Batu Kawan Bhd (BKB) before the state government gazetted the land under the Land Acquisition Act 1960 in 1990. After a lengthy legal case, BKB was then awarded RM15,000 per acre from the initial RM8,167 per acre. BKB tried to raise the compensation to RM40,000 per acre but was denied by the Federal Court in 2001 on the grounds that RM15,000 per acre was sufficient for compensation. 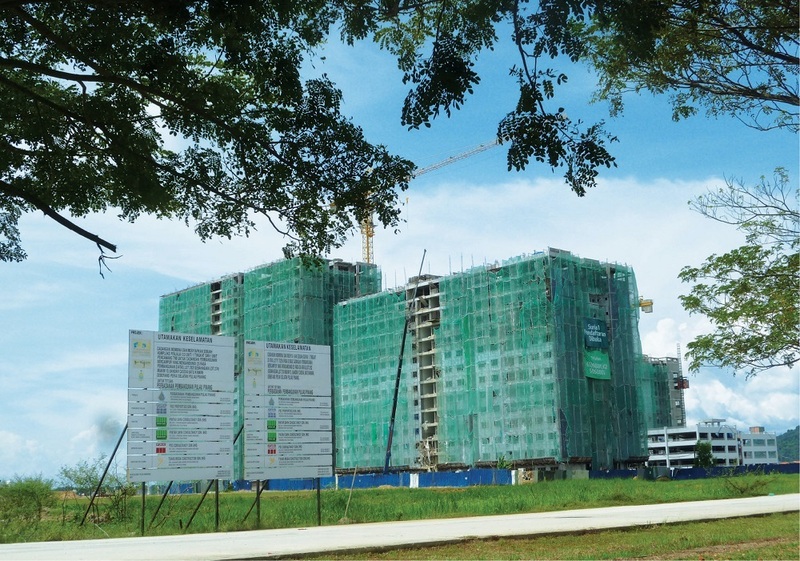 In 2014, the Penang Development Corp (PDC) started developing Batu Kawan with the introduction of Bandar Cassia offering 11,800 units of affordable housing comprising 3,372 low-medium cost apartments and 8,428 medium-cost apartments to be built over 80.9ha. The first launch called Suria 1 was made up of 149 low medium-cost units of 800 sq ft priced from RM72,500, 98 Type-B medium-cost 900 sq ft units priced from RM168,000 and 273 Type-A medium-cost 1,000 sq ft units priced from RM220,000. The 520 units are said to be nearing completion and will be issued the Certificate of Completion and Compliance by June next year. The 831-acre Batu Kawan Industrial Park (BKIP) was also promoted to attract high-technology and skill-intensive industries to the area. According to associate director of Henry Butcher Malaysia for Seberang Perai Fook Tone Huat, Penang mainland, which constitutes more than two thirds of the size of the entire state, holds the future of the state’s growth. “The mainland provides more opportunities for future developments than the island due to the scarcity of land on the island. Hence, the future of Penang would be focused on the mainland,” says Fook. However, while Penang Island has seen rapid growth as a port and tourism city, only a few towns on the mainland, such as Butterworth, Simpang Ampat and Seberang Jaya, are considered business hubs. Hence the excitement over Batu Kawan as the next growth area. “Batu Kawan is the upcoming growth area in Penang and in the northern region. It would be the new residential, commercial and industrial hub of the northern region,” Fook opines. 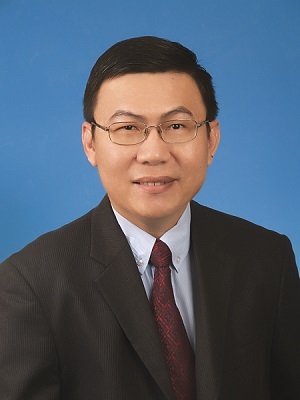 For CBRE WTW director Tony Lee Eng Kow, Penang mainland has been a hinterland to Penang Island with its industrial parks and residential neighbourhoods for the local working population. “Batu Kawan is intended to be the third satellite town for Penang after Bayan Baru and Seberang Jaya, both of which are already fully developed. A number of integrated developments have been planned for Batu Kawan under the Batu Kawan Master Plan,” Lee says. PA International Property Consultants (Penang) Sdn Bhd executive director Michael Loo shares that currently the main development hubs on Penang mainland are the old towns of Bukit Mertajam and Butterworth which have existed since the 1950s after World War II, and Seberang Jaya which is the first satellite township on Penang mainland developed since 1980 during the late Tun Lim Chong Eu’s tenure as the second Chief Minister of Penang. “It took about 20 years to transform Seberang Jaya into a mature satellite township. 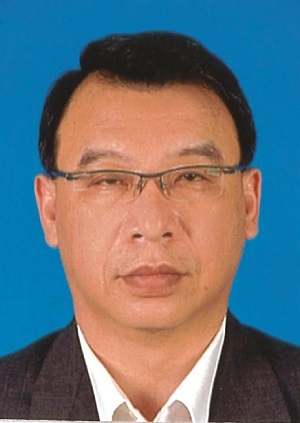 Similarly, we foresee the development of Batu Kawan might follow a similar development model,” says Loo. According to Loo, Batu Kawan has the advantage of having vast parcels of flat land owned by the PDC, which allows for proper town planning and township developments. This makes it easier for it to be developed into a satellite city compared with the older towns such as Bukit Mertajam and Butterworth. 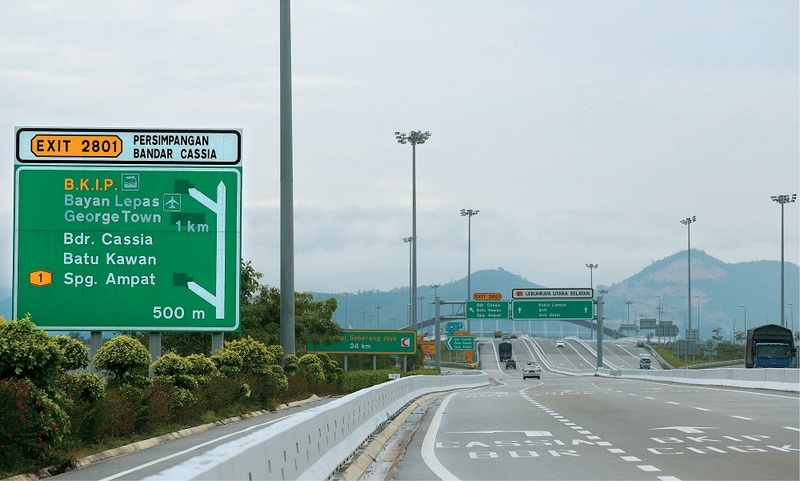 “The completion of the Second Penang Bridge in 2013, which connects the North-South Highway to Penang Island, was a notable infrastructure development that has eased accessibility and connectivity between the island and the mainland. “The other notable development is the BKIP where several major MNC (multinational) industry players such as VAT Manufacturing Malaysia, Boon Siew Honda and Hewlett-Packard have set up factories and created job opportunities in the southern district of Seberang Perai,” offers Loo. He also notes that PDC will be expanding BKIP to about 5,000 acres at the Byram and Changkat localities (southern part of Batu Kawan) and about 750 acres at Bukit Tambun (eastern portion of Batu Kawan). As for new property developments in Batu Kawan that are banking on its future potential, Loo cites Aspen Vision City by Aspen Group, One Auto Hub by PKT Logistic, Utropolis by Paramount Property, Design Village Mall and its surrounding projects by PE Land, IKEA furniture store and the upcoming developments by Eco World Development Group, including the 300-acre Eco Horizon and 75-acre Eco Sun township developments. “The new developments will help position Batu Kawan as the next well-planned satellite township,” Loo adds. Mainland residents are certainly looking forward to the RM10 billion Aspen Vision City that will include the first IKEA furniture store in the northern region. Spanning 245 acres of freehold land, it is one of the largest mixed developments in Penang. It offers a combination of condominiums, shop-offices, serviced suites, hotels, office tower, financial hub, medical centre, international school and a range of amenities. The first phase of Aspen Vision City is the 35-acre Vervéa comprising 441 three- and four-storey shop-offices with built-ups ranging from 3,300 sq ft to 7,830 sq ft. The second phase of Aspen Vision City is Vertu Resort, a resort-inspired condominium development with furnished move-in condition units. The project was soft-launched in February this year and is more than 60% booked. Aspen Vision City will also be seeing its first landed housing, a luxurious designer bungalow development called ViLuxe, being launched next year. PE Land (Penang) Sdn Bhd also recently launched Design Village Penang on Nov 23. The first premium outlet mall in the northern state which boasts some 400,000 sq ft is part of the 40-acre mixed-used development that will include a hotel, serviced apartments and high-end condominiums. Meanwhile, Paramount Corp Bhd's property arm Paramount Property has recently unveiled the 44.3-acre Utropolis Batu Kawan university metropolis development with an estimated GDV of RM1.8 billion in Batu Kawan. It is the group’s first development in Penang and will feature residential, commercial, retail and hotel components as well as a new flagship campus for KDU Penang University College. Beyond Batu Kawan, there are other significant developments including Pearl City by Tambun Indah Land Bhd, a 1,140-acre township in Simpang Ampat comprising landed properties, serviced residences, a commercial hub, international school and mall. According to CBRE WTW’s Lee, as Batu Kawan grows, it is likely that there will be more high-rise developments as the earlier developments were mostly low-rise and landed in nature. However, Henry Butcher’s Fook notes that the area has been seeing more high-rise apartments coming up as land prices have been rising. “Land price in 2006 was about RM10 psf. In 2016, it is about RM40-RM50 psf,” says Fook. 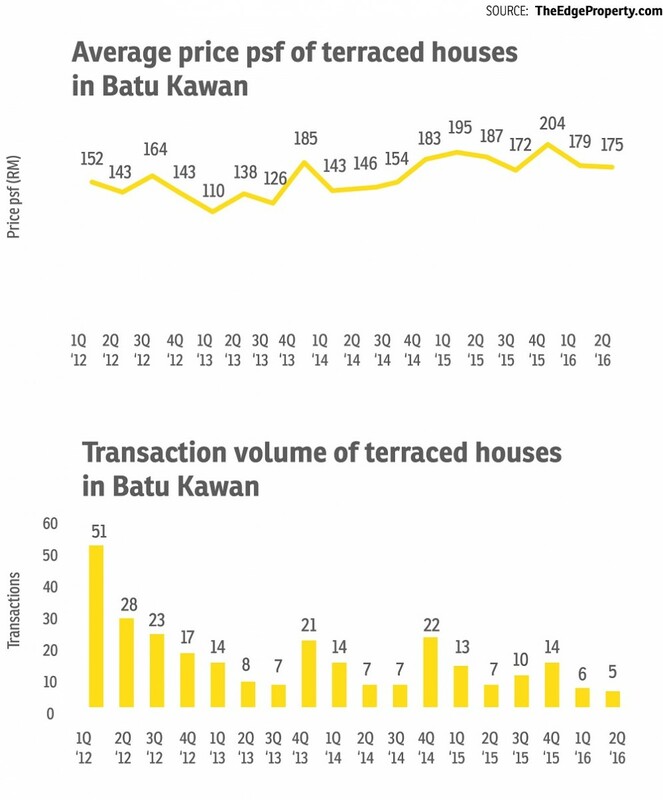 According to transaction data collated by TheEdgeProperty.com from the National Property Information Centre, terraced homes in Batu Kawan have seen their average price psf peak in 4Q2015 at RM204 psf, up 11.48% y-o-y. In terms of absolute average price, terraced homes in Batu Kawan recorded the highest transacted price of RM299,221 in 4Q2015, up 8.6% y-o-y. As at 2Q2016, the average transacted price was down by about 10% to RM175 psf (based on land area size). According to PA International’s data, a single-storey terraced house in Taman Intan Chempaka with a land area of 1,249 sq ft and built-up area of 703 sq ft was transacted at RM170,000 in 2015, a 13.3% growth since 2013 while in Taman Intan Delima, a single-storey terraced house with a land area of 1,320 sq ft and a built-up area of 805 sq ft was transacted at RM280,000 in 2015, up 21.7% since 2013. Meanwhle, a double-storey terraced house such as Callisia at Taman Crescentia with a land area of 1,475 sq ft and built-up area of 1,716 sq ft was transacted at RM400,000 in 2015, up 17.65% since 2013. 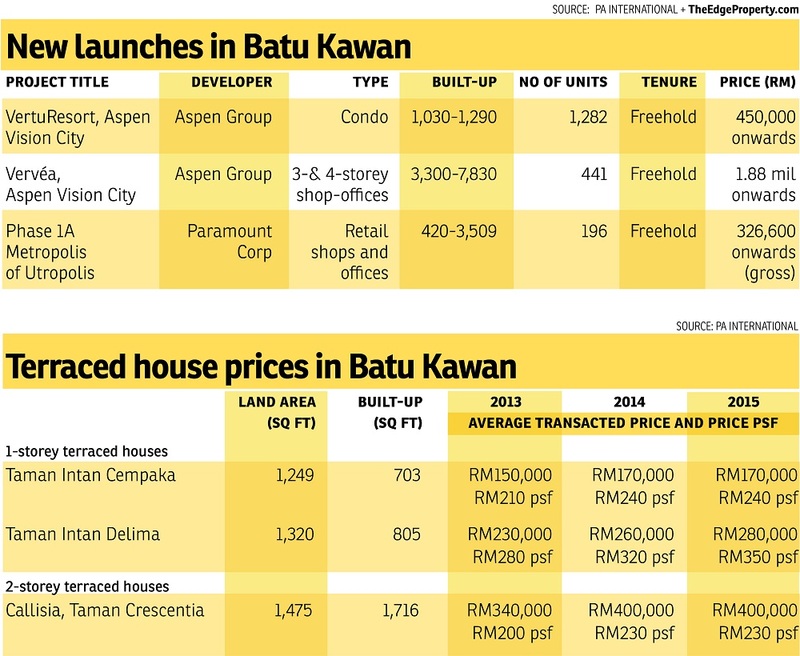 “The average price growth of existing housing in Batu Kawan from 2013 to 2015 was within the range of 10% to 20%,” offers Loo. He also notes that the launch price of a new Vertu Resort condominium unit in Aspen Vision City is about the price of an existing double-storey terraced house. “The upcoming projects will definitely have a positive impact on the pricing of the existing developments,” Henry Butcher’s Fook adds. According to PA’s Loo, the first phase of Aspen Vision City, which is expected to be completed by 2019, might be a vote of confidence to market players and homebuyers with the realisation and transformation of the oil palm plantations into a modern living satellite city. “Besides infrastructure development, a vibrant growing population is one of the key factors in determining the sustainability of a township. The state government’s efforts to attract new industrial players to establish their plants in Batu Kawan and create more job opportunities would be crucial in achieving the desirable population number,” says Loo. Nevertheless, it takes 10 to 20 years to establish a new mature satellite city. “The macro and micro economic environments will also determine the speed of the transformation,” he adds. The experts contend that although in the short term, there may not be many choices for investment, the medium term will see more choices become available as developers begin their developments. “I would advise investors to catch the earlier launches as prices are likely to be on the upward trend as newer developments come on stream and the place matures,” CBRE WTW’s Lee says. This story first appeared in TheEdgeProperty.com pullout on Dec 9, 2016, which comes with The Edge Financial Daily every Friday. Download TheEdgeProperty.com pullout here for free.